Congratulations to the University of Sioux Falls. 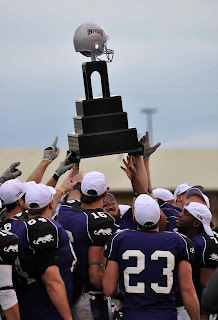 NAIA National Champs. These guys are good. We made the 14 hour trip to Rome, GA to witness this game. My son, Mitch is on the team. The seniors on this team have only lost once and that was in the national championship game. They beat a Div. 1 program this year. Could they be the best NAIA team ever?